Although new therapeutics are often the topic of debate and controversy amongst medical professionals, the fervor of debate regarding use of medical marijuana is more so. That is likely the result of society’s familiarity with marijuana, which may be quite familiar to some patients. Making therapeutic medicines out of plants was the birth of pharmacology and has been done for millennia, yet harnessing what is truly therapeutic, removing what is not while keeping the compound effective is the very essence of the controversy. We are in the moment of finding out if this can be done for marijuana as it segues into the medical realm. A recent increase in medical marijuana distribution centers across the US has reignited the conversation in the media and politics. Parkinson’s disease (PD) is one of the qualifying conditions for medical marijuana eligibility in many states.a However, clinical studies investigating the effectiveness of marijuana for the treatment of motor and nonmotor symptoms in patients with PD are sparse and primarily observational. As such, results are inconclusive and frustrating for both patient and provider. Many studies examining the efficacy of marijuana in PD are limited to questionnaires and observation in patients actively consuming marijuana either prescribed or recreational marijuana.1 In studies published to date, patients who had at least 3 months of treatment with marijuana used self-report to quantify any changes in their motor and nonmotor symptoms. A majority of patients treated with marijuana reported improvement in overall symptoms, specifically reduction of tremor, muscle stiffness, and pain, and improvement of depressed mood. Worsening of attention, memory, and urination were also reported, and a large percentage of patients reported having at least one adverse event including confusion, anxiety, hallucinations, amnesia, psychosis, a psychotropic event, cough, dizziness, unsteadiness, and breathlessness. The symptoms that improved in these studies are notable because when they are difficult to control with conventional treatment, we have few options left. Hard to control tremor, for example, may be treatable only with surgery, which is not an option for every patient. Hard to control pain is not unique to patients with PD; however, using stronger pain medications may not be possible due to cognitive and digestive side effects of these medications. Depression is profoundly common and affects disease progression and quality of life in ways that are difficult to overstate. Effective treatment for these nonmotor symptoms currently is suboptimal. The impact marijuana has on motor and nonmotor symptoms of PD may be modulated by the dopaminergic, adrenergic, serotonergic, and neuroprotective properties of cannabinoids. Tetrohydrocannabinol or THC and cannabidiol are the two major components of marijuana and are ligands for cannabinoid receptors found in the brain. THC is the primary psychoactive compound that causes the euphoric “high” feeling associated with marijuana consumption. There are 2 known cannabinoid receptors, CB1 and CB2, that have been cloned and well-studied. CB1 is one of the most abundant G-protein–coupled receptors in the central nervous system found in high concentrations on noradrenergic neurons in the basal ganglia, specifically the caudate putamen, substantia nigra, globus pallidus, hippocampus, and molecular layer of the cerebellum. This specific localization of CB1 may explain the impact of marijuana on cognitive and motor activity. CB2 receptors are found in peripheral immunocompetent cells and lymphoid organs and at smaller concentrations in the CNS. CB2 receptors have been found to modulate microglia activation and may play a role in neuroinflammation/neuroprotection. In the basal ganglia, excitatory and inhibitory neurotransmission is mediated by corticostriatal projections to the thalamus via the direct and indirect striatofugal pathways. CB1 receptors are found throughout this pathway, and stimulation of this pathway effects dopaminergic transmission in the dorsal striatum.8 Animal studies suggest the reverse is true in that denervation of dopaminergic neurons effects endocannabinoid transmission, leading to faulty striatal plasticity.9,10 Therefore, in the case of PD, in which there is impaired striatal plasticity, reciprocal interactions between cannabinoid and dopaminergic systems may respond to marijuana exposure in the same way that dopaminergic neurons respond to levodopa. While these studies and possible molecular mechanisms are promising, a major limitation is the lack of a placebo control. Most studies are observational and rely heavily on self-reported measures of improvement. Route of ingestion also causes an interesting problem. Traditionally, recreational marijuana is smoked, which causes significant variability in dosage. Regulations for medical use vary by state, and some states restrict specific forms of ingestion. Since a few studies have reported that smoked marijuana is more effective on pain and tremor compared to vaporized ingestion, this poses a large hurdle for clinicians and researchers. Although the existing evidence presented here is not directly useful in the clinic today, it does show that there is rationale to consider the use of medical marijuana in PD from a mechanistic point of view. When patients come in to clinic asking, “Would marijuana be helpful for me?” awareness of the molecular mechanisms of marijuana metabolites in the brain can help the clinician to give a well-considered answer. 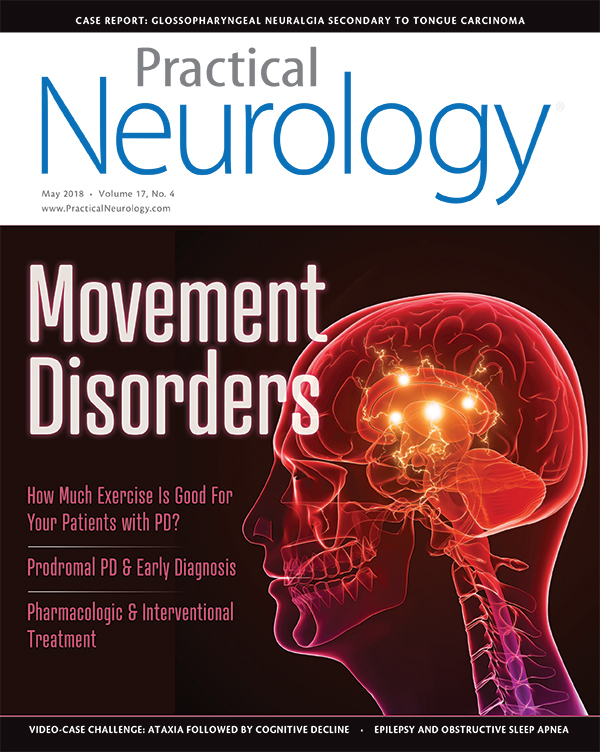 Keeping the perspective that PD is a neurodegenerative condition with limited treatments available, investigating a new one that has potential broad-spectrum applications offers cautious optimism over controversy. 1. Balash Y, Bar-Lev Schleider L, Korczyn AD, et al. Medical cannabis in Parkinson disease: Real-life patients’ experience. Clin Neuropharmacol. 2017;40(6):268-272. 2. Lotan I, Treves TA, Roditi Y, Djaldetti R. Cannabis (medical marijuana) treatment for motor and non-motor symptoms of Parkinson disease: an open-label observational study. Clin Neuropharmacol. 2014;37(2):41-44. 3. Kindred JH, Li K, Ketelhut NB, et al. Cannabis use in people with Parkinson’s disease and multiple sclerosis: A web-based investigation. Complement Ther Med. 2017;33:99-104. 4. Shohet A, Khlebtovsky A, Roizen N, Roditi Y, Djaldetti R. Effect of medical cannabis on thermal quantitative measurements of pain in patients with Parkinson’s disease. Eur J Pain. 2017;21(3):486-493. 5. Masilamoni GJ, Groover O, Smith Y. Reduced noradrenergic innervation of ventral midbrain dopaminergic cell groups and the subthalamic nucleus in MPTP-treated parkinsonian monkeys. Neurobiol Dis. 2017;100:9-18. 6. Masilamoni GJ, Smith Y. Chronic MPTP administration regimen in monkeys: a model of dopaminergic and non-dopaminergic cell loss in Parkinson’s disease. J Neural Transm (Vienna). 2018;125(3):337-363. 7. Matyas F, Yanovsky Y, Mackie K, Kelsch W, Misgeld U, Freund TF. Subcellular localization of type 1 cannabinoid receptors in the rat basal ganglia. Neuroscience. 2006;137(1):337-361. 8. Martin AB, Fernandez-Espejo E, Ferrer B, et al. Expression and function of CB1 receptor in the rat striatum: localization and effects on D1 and D2 dopamine receptor-mediated motor behaviors. Neuropsychopharmacology. 2008;33(7):1667-1679. 9. Kreitzer AC, Malenka RC. Dopamine modulation of state-dependent endocannabinoid release and long-term depression in the striatum. J Neurosci. 2005;25(45):10537-10545. 10. Kreitzer AC, Malenka RC. Endocannabinoid-mediated rescue of striatal LTD and motor deficits in Parkinson’s disease models. Nature. 2007;445(7128):643-647. 11. Chung YC, Baek JY, Kim SR, et al. Capsaicin prevents degeneration of dopamine neurons by inhibiting glial activation and oxidative stress in the MPTP model of Parkinson’s disease. Exp Mol Med. 2017;49(3):e298. 12. Nam JH, Park ES, Won SY, et al. TRPV1 on astrocytes rescues nigral dopamine neurons in Parkinson’s disease via CNTF. Brain. 2015;138(Pt 12):3610-3622. 13. Le W, Wu J, Tang Y. Protective microglia and theirregulation in Parkinson’s disease. Front Mol Neurosci. 2016;9:89.